A cheery sunflower-yellow surrounding deep brown centers. Del Sol is extra-early and long-stemmed. 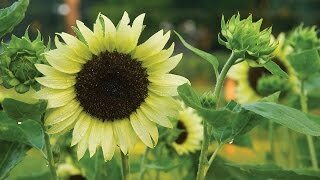 Great for cutting, these hybrid sunflowers won't shed on tabletops. Ready to cut for the vase just 50 days after sowing seed. Sunflower, Del Sol Hybrid is rated 4.3 out of 5 by 4. Rated 2 out of 5 by forgetmenot from Lovely but didn't grow well for us... We had much better luck with other sunflower varieties in previous summers. Not sure why these didn't grow as well for us. Rated 5 out of 5 by nsany from Terrific germination, piece of cake to grow We planted a ton of Del Sol seed earlier this season, and the germination rate was outstanding. With a bit of water and fertilizer, these sunflowers grew tall and strong (although they're still a bit short of the 5-6' I thought they'd be). All of them have at least one massive bloom, with several smaller blooms per plant. If I had only wish, it would be that the plants grew just a bit taller, so it served as a taller backdrop. Overall though, these are five star plants, and I highly recommend them to anyone. Rated 5 out of 5 by gunvy0407 from Gorgeous flowers These were too beautiful to cut. They stood tall among the zinnias and cosmos at just the right height to provide a lovely backdrop. The branching nature of the flowers was a plus. I didn't cut the heads but left them - we had lots of goldfinches last summer that simply adored them. Germination was quick and vigorous - I will definitely plant them again.